If recent reports are anything to go by, we are about to see a couple of pretty exciting smartwatch releases in the second half of 2018. These being the Samsung Gear S4 — or Galaxy Watch as it will actually be called — the Apple Watch Series 4, and the Google Pixel Watch(es). Now, this is going to be a tough battle, especially for Google. Apple is already reigning supreme on the smartwatch market with its usual mass-appeal approach, while Samsung is enjoying quite a bit of popularity as well with its excellent Gear lineup of Tizen-powered wearables. Both companies offer good-looking, feature-rich, durable products that are becoming increasingly harder to compete against, so far as the average user is concerned, at least. Google, however, intends to jump into the smartwatch race head-first this year with its own, in-house developed Pixel Watch. Android smartwatches have had a tough couple of years, dragged behind the competition by aging hardware and less-than-optimized software. However, with the rebranding and revamping of Android Wear into Wear OS, the software side of things is looking brighter, and with Qualcomm's upcoming Snapdragon chipset for wearables, the hardware part of the equation seems to be solved as well. A new page is being turned for Android smartwatches, and Google is reportedly planning to spearhead the new beginning with its own Pixel-series smartwatch. How will it stack up against the upcoming Apple Watch Series 4? Here's everything we know so far. When it comes to smartwatch design, there's an endless argument going on about round versus square. There are plenty of good points to be made on both sides of the argument, but we're not here to dispute or defend any of them. The Google Pixel Watch and Apple Watch Series 4 are likely going to represent this contrasting approach in designing smartwatches – the new Apple Watch will undoubtedly retain the angular footprint of its predecessors, albeit with a larger screen, while the Pixel Watch is likely to adopt the round aesthetic of most Android smartwatches preceding it. There could be more than one Pixel Watch model, so a rectangular design is not completely out of the question, but what little we know about the device seems to point towards a round shape. Android smartwatches have traditionally relied primarily on touchscreen controls to interact with the UI, much to their detriment. When using a round display under two inches in size, however slender your fingers may be, swiping and tapping can become an exercise in frustration, especially when in a hurry. Samsung and Apple have devised clever workarounds with the rotating bezel and rotating crown respectively, which supplement the otherwise cramped touch experience nicely. To be fair, there are Android smartwatches out there that have tried to do the rotating crown (not the least bit because Samsung holds a patent on the rotating bezel design), but the vast majority have relied on the touchscreen and one or two buttons for "back" and "home". Either way, we've got our fingers crossed that Google has figured out a way to introduce a hardware control component (most likely a crown) that will help with scrolling and navigating menus easily. As for the Apple Watch, well, there's no reason to believe that the way it controls will change significantly from previous iterations. That is, the rotating crown will return. All signs point toward virtual assistants becoming a huge part of wearables (and everything else) this year. Samsung is pushing Bixby hard, despite the initial lukewarm reception, Apple is constantly improving Siri, while Google is trailblazing with Assistant. There's little doubt that the Google Pixel Watch, the Apple Watch Series 4, and the Gear S4 will all heavily rely on their respective assistants to enrich and streamline the experience, especially when connected to wireless earbuds. And no wonder that things are going this way. When it comes to smartwatches, with their limited screen real estate and control options, issuing voice commands to a digital assistant — be it through paired earphones or a microphone on the watch — could help simplify things quite a bit. We don't know yet what Google has in store for Assistant on the Pixel Watch, but we are particularly excited about it, considering how vastly it has improved over the past year, and on such a wide range of platforms. Earlier this year, Google announced new features for the Assistant on Wear OS — contextual suggestions to follow up on conversations with your Assistant, the ability to control smart connected devices via your Wear OS watch, and the fact that Google Assistant on Wear OS will now have a voice. 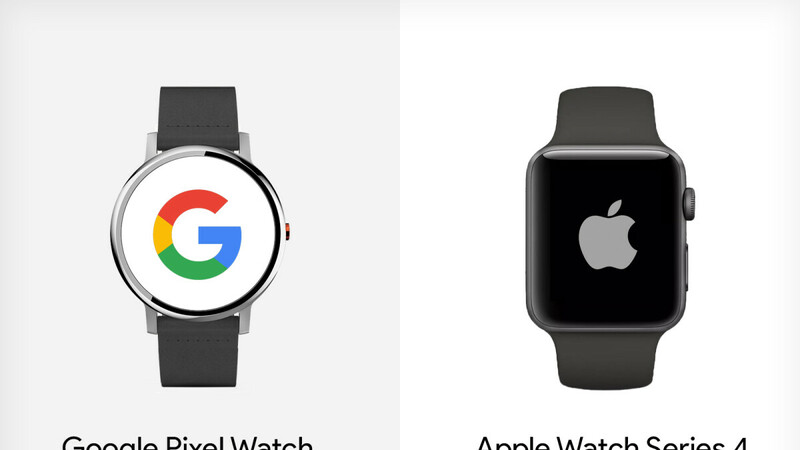 So, it's fair to assume that the Pixel Watch will probably have a speaker of some sort. Apple has similar plans for Siri on the Apple Watch Series 4, as evident by the updated Siri face in watchOS 5, which harnesses the power of AI and introduces extended third-party app integrations to deliver a highly customized experience. There's no doubt that Siri will play a major role in the upcoming Apple Watch and we are eager to see how the company will improve on the virtual assistant as it becomes an even bigger part of its product lineup. Health and fitness tracking are some of the most important features for wearables, even in more "casual" models. Apple is rumored to be working on a significantly expanded set of helth tracking tools for future wearables, possibly even including an EKG monitor. EKGs, also known as ECGs or electrocardiograms, are tests that record the electrical activity of the heart and are much more accurate in their measurements than standard methods currently used in consumer tech. Whether we'll see this on the Apple Watch Series 4, or another model in the future, remains to be seen, but we are expecting this year's offering to be excellent when it comes to fitness tracking. There are also rumors that the Apple Watch Series 4 may have blood pressure monitoring capabilities. Apple was recently granted a patent for a blood pressure monitor housed in a wearable device, and the upcoming smartwatch could employ similar tech. Furthermore, Samsung earlier this year proved that a smartphone could be used to accurately measure blood pressure, so we wouldn't be the least bit surprised if the tech came to smartwatches in the second half of 2018. Since Google is the newcomer, it's hard to tell what the company will come out with regarding health and fitness tracking. The Pixel Watch will be a first-generation device, so some shortcomings and missing features are to be expected. There is no rumored release date for the Pixel watch yet, but if we were to venture an educated guess, we'd name October as a likely release window, as the Pixel 3 and Pixel 3 XL are expected to be unveiled and released that month as well. As for the price – it's anyone's guess at this point. If the Pixel phones are anything to go by, Google may aim for a slightly higher price tag with the Pixel watches, depending on how "premium" they are. On the other hand, seeing as how the competition from Apple and Samsung is going strong, Google may price the Pixel watch lower and try to gain a foothold in the wearables market this way. If I were to get an android watch this would be the one. I like most google products that run android because they are a more pure form and get better updates. Is it going to be pure from a design point of view too? The plain circle just looks really boring. There has been zero rumors on the pixel watch so why not keep these articles until we are closer to october? What we know so far. Pathetic battery life - both models. what i know so far. Apple watch will be the same as the first apple watch 4 years ago. ugly. Apple Watch is far superior in every way!